Melon-headed whales (Peponocephala electra)are found commonly in pelagic, tropical, and sub-tropical waters throughout the world. Population estimates for melon-headed whales range from approximately 5,000 individuals throughout the Hawaiian islands to over 40,000 across the eastern tropical Pacific. A group of melon-headed whales off Hawaii Island. Melon-headed whales often make fast, low leaps from the water as they swim. Image credit: NOAA Fisheries, Pacific Island Fisheries Science Center (Marie Hill; NMFS Permit #774-1714). Melon-headed whales have a small, torpedo-shaped body and can reach a length of 2.7 m (9 ft) and weight of 210 kg (460 lbs). They have a small, rounded head and no discernable beak. They have a relatively large dorsal fin,pointed pectoral fins,and broad flukes. They have dark bodies with a large dorsal “cape” (darker area of coloration extending from the head to the tail). White markings around the mouth give the appearance of lips, and dark facial markings around the eyes give some individuals the appearance of a mask. Melon-headed whales are often confused with pygmy killer whales, which have sharper pointed flippers and a more triangular head. They may also be confused with false killer whales, which are much larger. This species is highly social and often occurs in tight groups of 100-500 animals, although they sometimes gather in the thousands. They are often associated with schools of Fraser’s dolphins and have been sighted in mixed schools with spinner dolphins, bottlenose dolphins, rough-toothed dolphins, short-finned pilot whales, and spotted dolphins. Melon-headed whales rest at the surface in the morning, socialize in the afternoon, and then forage at night on fish, cephalopods, and shrimp. 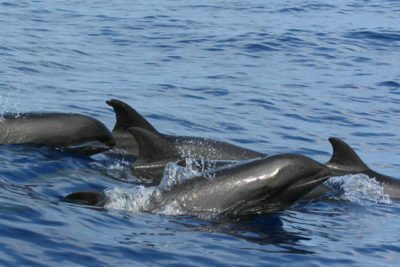 The melon-headed whale vocal repertoireincludesclicks,burst-pulsed sounds, and whistles.Passive acousticrecordings of melon-headed whales in the Palmyra Atoll (Pacific Ocean) show echolocationclicks, primarily associated withforaging and/ornavigation, occurring at higher rates during the night and decreasing toward sunrise. The lowest click rates have been observed late in the morning and around noon. Median peak frequencies for the clicks ranged from 25.3 to 28.5 kHz. Whistles, primarily associated with social behaviors,are simple frequency-modulated sweeps. The whales actively produce whistles in the afternoon until shortly before sunset. Melon-headed whale whistles (recorded for animals in Hawaiian waters) typically range between 5 and 11 kHz, and are relatively short, with a mean duration of 586 ms. Animals and Sound > How do marine mammals use or make sound when feeding? Animals and Sound > How do marine mammals use sound to navigate?